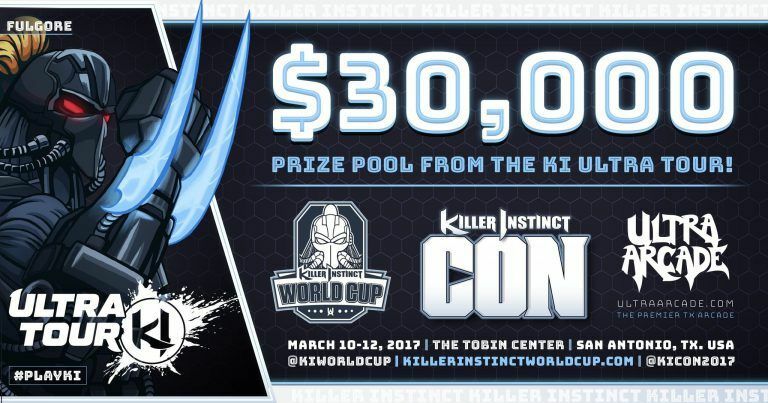 Brandon Alexander here to give you some info before Killer Instinct World Cup & KI Con tickets go on sale so you can plan accordingly! For those who don’t already know, KI Con is the Ultimate Killer Instinct experience with over 183,000 sq. ft. of KI. Be a part of tournaments, meet voice actors, all of the developers and pro players and much more! The Killer Instinct World Cup is the culmination of a yearlong ranking system that took place during 2016. The World Cup itself is a first of its kind for Killer Instinct, and the upcoming 2017 tournament serves as the brand’s inaugural event. With our ranking system we have determined the 27 best players from around the world. These qualified players will join 5 more competitors qualifying at the event to establish a best-of-the-best 32 man world-class tournament. We were pleased to announce that the Killer Instinct Ultra Tour is drastically expanding the KI World Cup! The tournament will now feature 32 powerful Killer Instinct players, all fighting for their share of $30,000! On top of that, qualifying for the finals bracket this March guarantees a payout, as the $30,000 prize pool is split all the way down the 32 participants! 5 spots are reserved for last chance qualifiers on site at the KI World Cup itself! That’s right, even if players don’t have enough points to qualify, they can still show up, compete in a last chance qualifier, and make their way into the final bracket and the money! These last chance qualifiers will come in the form of four brutal single elimination brackets. Players are free to compete in all four of them to try to earn their spots in the finals! The 5th spot will go to the winner of our KI Last Chance Qualifying Pro Battle. More Info on this is coming really soon! To check out the KIWC Standing go to www.killerinstinctworldcup.com! *Note – Ultra and Killer KI Con Passes, which guarantees theater seating, are very limited and going fast! HOTEL DEALS START ALONGSIDE KILGORE’S RELEASE! 4 KIWC Last Chance Qualifier brackets, & special KIWC exhibition events! The top 32 final bracket for $30,000! More Info & Games Coming Soon! That’s all I have for today! Hope you all enjoy the rest of your Holiday!